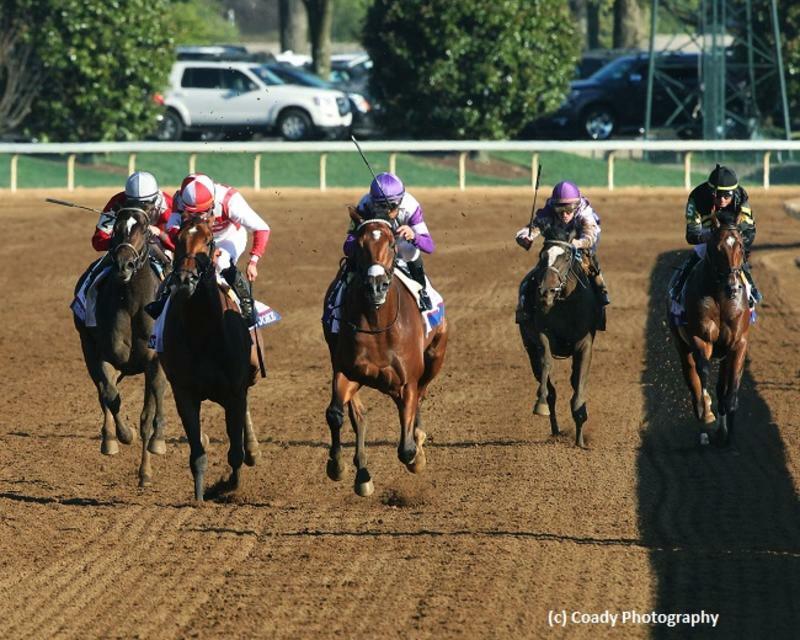 The $1 million Blue Grass (G2) at Keeneland delivered a surprising outcome with Irap recording a 31-1 upset. He’s headed to the Kentucky Derby for owner Reddam Racing and trainer Doug O’Neill. Runner-up Practical Joke offered a fine showing, advancing to be a serious threat in midstretch before coming up short by three-quarters of a length, and the multiple Grade 1-winning juvenile stamped his Kentucky Derby ticket with the 40-point prize. The Blue Grass could yield five starters for the Run for the Roses on May 6, with McCraken, J Boys Echo and Tapwrit also presently located within the top 15 on the Kentucky Derby Leaderboard. Practical Joke improved upon a non-threatening second in his 2017 debut, the March 4 Fountain of Youth (G2) at Gulfstream Park. And while it would be nice to see a triple-digit BRIS Speed rating on the resume, the Chad Brown-trained colt registered a career-best 99 in the Blue Grass and remains eligible to show more at Churchill Downs if he handles the 1 ¼-mile trip. McCraken, the 5-1 favorite in the final Kentucky Derby Future Wager (Pool 4) that closed on April 2, sustained his first career setback. Perfect from three starts at Churchill Downs last year, including the Kentucky Jockey Club (G2), the Ian Wilkes-trained colt opened his sophomore campaign with a victory in the February 11 Sam F. Davis (G3) at Tampa Bay Downs but missed a scheduled appearance in the March 11 Tampa Bay Derby (G2) due to an ankle strain, returning from a 56-day hiatus as the 8-5 choice in the Blue Grass. Supporters will be looking for improvement off the third-place effort. McCraken was under a snug hold early and was outpaced by Practical Joke into the far turn. He launched a wide bid into the stretch, drawing even with Practical Joke as they straightened for home, but flattened out in the final furlong. McCraken wound up three lengths back of the runner-up, netting a disappointing 96 BRIS Speed figure, and he’s never earned a triple-digit number. But the Ghostzapper colt probably needed the tightener and he now moves to his favorite track. And McCraken should receive a better set-up for his late turn of foot on Derby Day. J Boys Echo didn’t run back to his eye-catching victory in the March 4 Gotham (G3) at Aqueduct, checking in 2 ½ lengths behind McCraken in fourth but also didn’t experience a clean trip, being forced to check after advancing into tight quarters entering the far turn and altering course after nearly rallying into the heels of Practical Joke in the stretch drive. His BRIS Speed ratings dropped steeply, from 104 to 93, but backers will take a glass half-full view. Similar to McCraken, the late-running J Boys Echo can benefit from the tune-up and may receive the same circumstances next time (hot/contested pace) that proved so advantageous two starts back. Tapwrit didn’t fire in a disappointing fifth-place effort. He failed to break cleanly and traveled extremely wide on the far turn, but the gray colt never resembled the same horse who romped in the Tampa Bay Derby. Beaten 11 ½ lengths as the 2-1 second choice, Tapwrit has enough points (54) and connections will draw a line through the Blue Grass performance if he runs back in the Kentucky Derby.